Virtual orchestra technology allows you to effortless play your favourite songs with Full Band, Pianist and Guitarist musical stylings, whilst enjoy authentic instrument tones. Ideal for beginners and seasoned hobby players alike the EZ10 features a wide array of easy play features at a very competitive price. Built inside the compact, contemporary cabinet are beautiful orchestral tones, full rich Lowrey organ tones and rhythm styles with full intros and endings. For a great musical experience the EZ10 showcases Lowrey’s Easy Play technology including Harmony, Style Set-ups, Song Set-ups, Fake It! and more. There is a headphone socket for silent playing and the EZ10 comes with a matching bench with music storage. 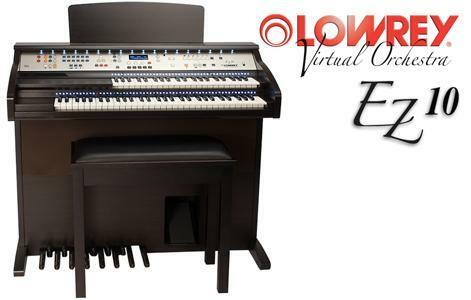 Whether you are beginning your musical hobby, or perhaps having to downsize your current instrument, the new Lowrey EZ10 is sure to be your new musical companion.